What comprises a LiDAR collection system? What does a LiDAR data set consist of? What formats are used to distribute LiDAR point clouds? What kind of information is in a typical LAS file? What is meant by the return number? Why is the time in the LAS file given in seconds instead of a normal date? 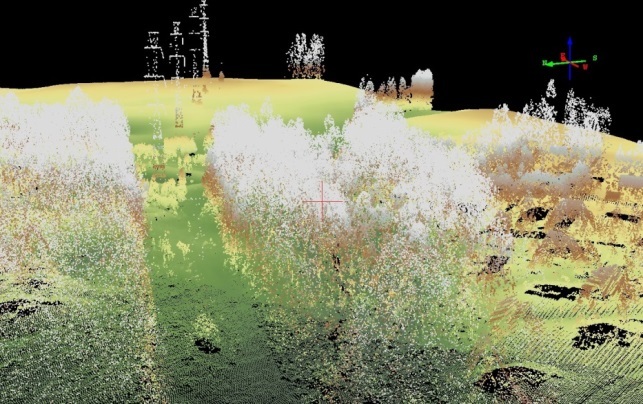 Are point clouds the only LiDAR data sets available? Where can one get LiDAR data for New Jersey? LiDAR, which is an acronym for Light Detection And Ranging, is an active remote sensing technology that uses laser light pulses to gather information about the features being scanned. Light pulses are emitted from a light source that can be housed in an airplane, helicopter, ground vehicle, or even a stationary terrestrial platform, and the times that it takes light pulses to hit an object and return to a sensor are recorded. Those times are then used to calculate distances traveled, and, most often, elevations of the object struck by each light pulse. Because LiDAR data can be collected over large areas in a relatively short time period, and because of the elevation accuracies that LiDAR systems can now achieve, commonly +/- 10-15 centimeters, LiDAR is now a primary source of elevation data for generating bare earth digital elevation models (DEM). While there are many types of LiDAR systems, they all share some common elements. All systems, both airborne and terrestrial, will have a laser light source, a sensor to capture the return pulses, and a GPS positioning device to record positional coordinates of all source and object pulses. If the system is an airborne one, there will also be an inertial measurement unit (IMU) on board. IMU's track the pitch, roll and yaw characteristics of the airplane. These measurements are used to determine the airplane's true position in relation to the ground surface being sensed at all times. This position needs to be known precisely to correctly calculate the travel time, distances and elevations of the pulses and objects. LiDAR collection systems generate massive data files with records of every pulse return that is generated over a study area. These data files are generally referred to as point clouds or mass point files. Both of these are good descriptive terms for a LiDAR data set since, in a standard LiDAR project, there may be on the order of 5 to 10 million points collected for each square mile of ground surface studied. LiDAR data sets really are masses or clouds of extremely large numbers of data points. LiDAR data can actually be presented in a simple ASCII text file that includes just an x, y and z value for every return point processed. This was the format that early LiDAR collections used. However, because there can be much other information collected or processed for each return, most LiDAR data is now provided in a special binary file called a LAS file, (LAS coming from LASer). So that LiDAR data from different systems can be used together, the American Society for Photogrammetry and Remote Sensing (ASPRS) has now developed standards for LAS file formats, and all LiDAR data now generated usually are provided in a standard ASPRS LAS format. One of the important features of the post processed LAS file is the classification of each return, or more correctly the classification of the type of feature the light pulse struck. Normal feature types include bare earth, water, low vegetation, medium height vegetation, high height vegetation, and buildings, among others. At a minimum, returns are usually classified to be water, bare earth and non-bare earth points, with other types of non-bare earth points, such as buildings and vegetation, included depending on the use of the data. Having the bare earth points classified, allows the point cloud to be used to create the bare earth or ground level digital elevation model (DEM) of the study area, which is one of the primary uses of airborne LiDAR data. The standard APSRS file format has reserved class codes for these primary point classes with bare earth points always given Class 2, and water points Class 9. Times recorded for light pulses collected in a LiDAR project are given in a system called GPS time, since GPS data are integral to tracking the LiDAR pulses. GPS time started at midnight Sunday, January 6, 1980, which is when the first GPS satellites became active. It is counted by the number of seconds in each week since January 6, 1980, which is week 0 (zero). The time stamp for a LiDAR point is the total number of seconds that have elapsed from midnight January 6, 1980. GPS time converters are available that can convert the total number of seconds to an actual date. For example, the time of 1,018,084,530.0000 seconds given for the sample point above equates to a date of April 10, 2012, 9:15:15 AM. The raw and post processed point clouds, often called the unclassified and classified LAS files, are the data format in which the actual point returns are delivered. While the point clouds are extremely valuable for performing many kinds of surface analysis, it is the derived LiDAR products which are most widely used. Included in these derived products are bare earth digital elevation models (DEM), first return digital surface models (DSM), hillshade files (shaded relief surfaces), triangulated irregular networks (TIN), and elevation contours. The most important of these are the DEM and the hillshade file. The DEM is a raster data type with each cell or pixel storing a ground elevation value calculated from the bare earth points in a LiDAR collection, and can be used in a many different GIS raster processing operations. The hillshade file is simply a 3-D shaded relief layer of the DEM, and is very helpful in visualizing what the terrain actually looks like. Contours, which are vector layers linking points of the same elevations, are also a common LiDAR derived product, and familiar to most people as one of the data types shown on a topographic map. There are several sources for New Jersey LiDAR data, both the raw and classified point clouds and the derived products. The Office of GIS (OGIS) within the Office of Information Technology is presently the state branch handling the distribution of LiDAR data sets covering New Jersey. Because of the size of the collections, distribution from OGIS is by request, with the distribution on external hard drive. Read the instructions for acquiring the data from OGIS. New Jersey LiDAR data is also available from several federal distribution sites. The USGS posts LiDAR data sets for download on several sites including EarthExplorer, and The National Map. LiDAR data covering coastal areas of New Jersey are also available from NOAA's DigitalCoast site.